The Amateur Traveler travels to Geneva and experiences the Escalade which celebrates the defeat of the Savoy in 1602. Geneva is the home to many UN agencies, an old town, a cathedral and an excellent rare book collection. You can also find lots of ways to eat melted cheese and other Swiss treats on the shore of beautiful Lake Geneva. In this unusual episode Chris overcomes a technical microphone difficulty to record an episode on the road. 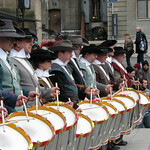 This episode includes some of the sounds of the Escalade festival.